You can filtering rows, sort rows, reorder columns, hide/unhide columns. You can copy the console command for all NPCs which is listed to the clipboard. 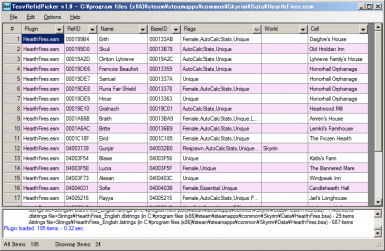 - Fixed a bug that cannot load Dragonborn.esm. It occures when don't cleaning with TES5Edit. Processing of XXXX field was incorrect. - Rebuild with Visual Studio 2015. - Fix problem that RefId/BaseId is blank when load order of plugin is more than 128. - Fix problem that cannot be end the utility when ini file cannot be written. - When resized a main window, fixed height of logging area. - Console comman menu "Prid <BaseID>" change to "<BaseID>". Because "Prid <BaseID>" is invalid command, totally meaningless. - Fixed malfunction of when the master plugin file not found. - You can export CSV file. Currently showing rows will be output. The codepage depends on the plugins language option. Separator character is TAB. - Add "Override Codepage with UTF-8" option. This option is for some languages using UTF-8 (Japanese, etc. ), usually check is not required. Thank you so much for your endorsement and kind words. If you want to find any NPC in game, you can use following mod. You can view and control the NPC that added by plugins. This utility UI supports multiple languages, now available English and Japanese. 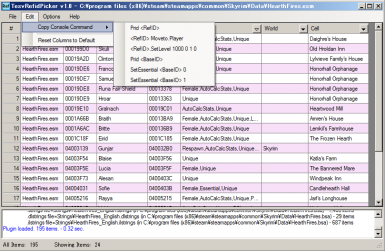 Drop and drop plugin files (esm or esp) to main window, or select files from the "File - Open" menu. Note: If you open the plugins in this way, First byte of FormID remains of the values defined in the plugins. Please note that this is different from the formid in the game. Select "File - Open from Skyrim/Data folder" menu, then select plugins, finally press "OK" button. Note: If you open the plugins in this way, First byte of FormID will be changed to same as load order. So FormID will be same as in-game FormID. - Right-click column header : Show column menu. You can hide/unhide rows, and remove filter. - Click a button in the right of column headers : Show filter menu. You can filter the rows in various conditions. Soon after having opened up plug in, "Flags" column is filtered to show only "Unique" NPCs. If another NPC also want to show, please change the filter. Select "Edit - Copy Console Command" menu. Several sub-menu appears. If you select a sub menu, copy a console command for displayed NPC to clipboard. 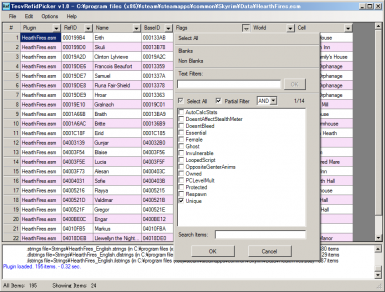 Select "File - Export CSV" menu. Currently showing rows will be output. The column is hidden, all columns are output. The codepage depends on the plugins language option. Separator character is TAB. When there isn't a NPC definition records in plugin, some columns will be blank. If you check this option, this utility will also read definition of NPC from the master plugins. - Register the TesvRefidPicker.exe to the executable menu, and launch from executable menu. Delete the installed files. Registry does not used. I'm not an English native speaker. Improvement suggestion of the sentences is a welcome. - When open NPC appearance change mods such as SBF/Bijin NPCs, NPC will not be shown. Because these mods not include RefId (include NPC definition only). This is specifications. If utility crashed or bugged, please post a plugin name and error message (within stack trace) to nexusforums or Twitter.